Get your 2018 Louise Limb calendar now! 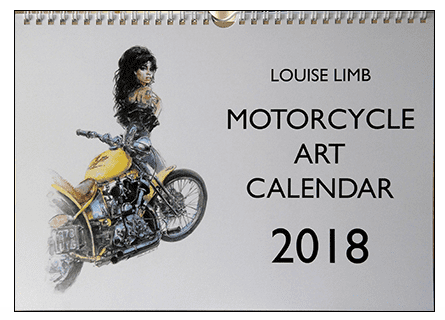 Well known for her motorcycle illustration work, our own Louise Limb has been collecting some of her favourite works to put in her very popular calendars for the last eight years. Her Motorcycle Art calendar for 2018 will feature a selection of classic images from her illustration archive and maybe even the odd surprise new piece and is guaranteed to brighten even the darkest January or February day. Retailing at just £17 including UK postage and packing (see Louise’s website for overseas shipping costs and other postal options), each A4-sized calendar comes in a board-backed envelope, and the first 100 are personally signed and numbered by Louise herself. Next Post:Carole Nash Winter Classic this weekend!